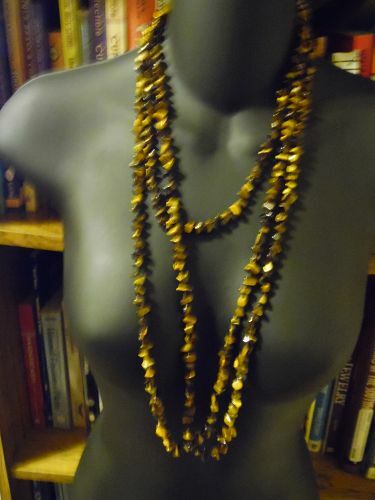 Banana Republic Tigers eye and smoky Banana Republic tigers eye & smoky faceted acrylic panel necklace. 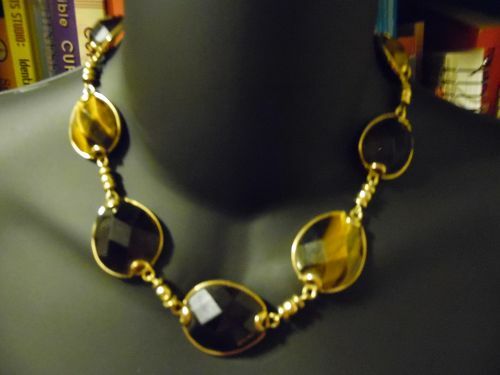 Gold tone set with alternating links of tigers eye and smoky 1" cabochons and gold tone bezels. Very nice condition. Little to no wear,with hang tag. Measures about 16". Go to gorgeous lengths with this beauty. Tiger's-eye chips in different shapes and sizes are individually strung and knotted between each bead to create the stunning design of this necklace by Carolyn. Wrap it around multiple times for a lavish layered look. Sterling silver beaded toggle closure Measures approximately 80"L x 1/4"W Sold on QVC, Like new condition Just Beautiful!! This is a lovely locket, measuring 1.5" in diameter. 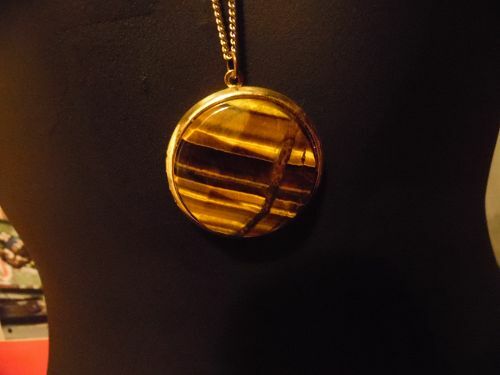 Gold tone and is set with a large faceted Tigers Eye cabochon. Opens and closes nicely. Nice 30" chain with additional 3" extension, Beautiful condition. This is a striking owl pendant. Gold tone 3-D with large moonstone cabachon for the belly, white enamel around the eye area and two large sparkling rhinestones for the eyes. The back is covered by a separate detailed 0pen filigree backing with openwork and feather detailing, Which gives it the 3-d effect. No makers mark though. Nice 28" chain included. Owl is 2 1/2" tall, Excellent condition with no scratches. 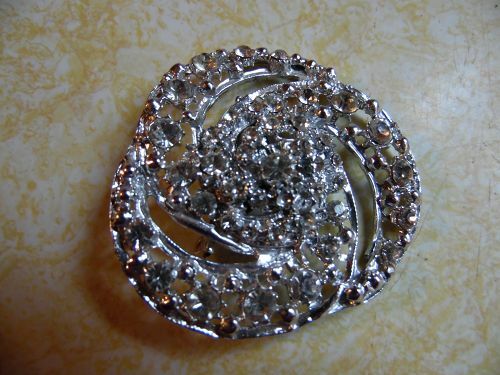 Large silver tone rhodium pin brooch with crystal clear rhinestone crystals. Measures 2 3/8" diameter. All stones are present. Pin backing works well and has a safety latch. Very nice and no discoloring or flaking to the plating. 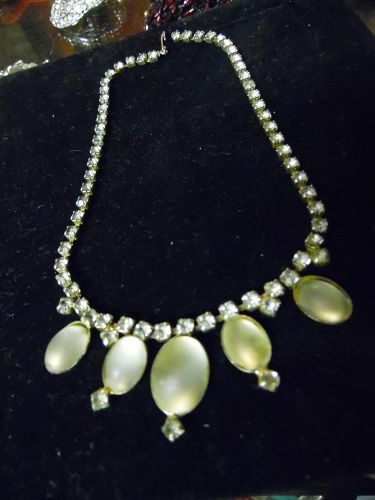 This vintage necklace has unusual frosted glass cabochons. The smaller rhinestones are crystal, but the large cabochons are frosted white. Measures barely over 15" long with the hook clasp. All stones are intact. 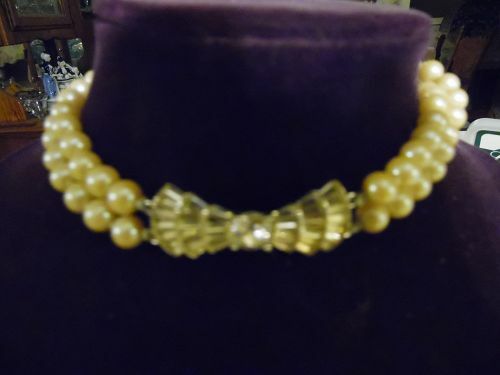 A very sweet vintage necklace. It is unsigned. 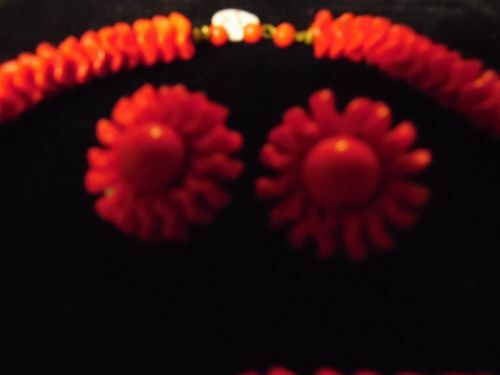 Gorgeous vintage necklace and matching clip earrings. 11 strands of small faceted cut beads of dark red. 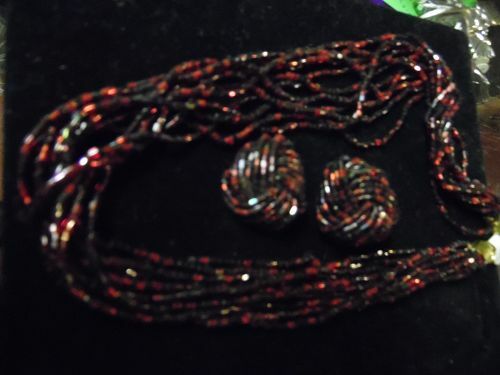 They appear to be red and black because of the shimmer of the faceting on the beads. Button style earrings have clip backings. Necklace will fit up to a 19" neck. Vintage button style earrings with clip backs. Large button style with a cluster of aurora rhinestones in the center. Has a diameter of 1 1/2". Very nice condition. 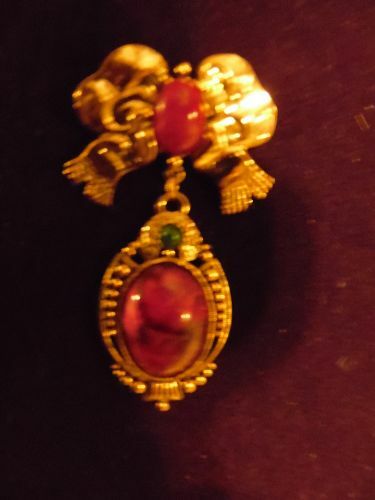 Beautiful Victorian style pin with antique gold setting. Pin features a large bow with the red agate cabochon and an oval suspended pendant, with a matching cabochon.Looks to not have been worn. I believe this is from the 1928 Jewelry Co line. Measures 3" long. 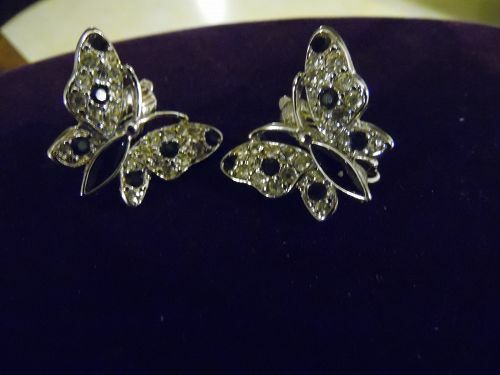 Lovely signed Trifari butterfly earrings.Silver tone settings with crystal rhinestones on wings with black rhinestone accents.Clip backs. Measures 1" x 1 1/8". Pristine like new condition. 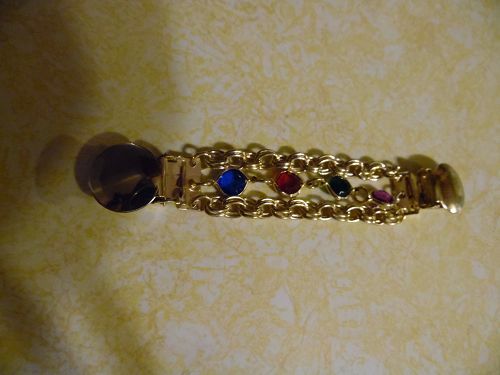 Pretty gold tone metal, with multi color stones of purple, red, green, and blue with chains. Clip backs are nice and tight. Measures 5" long. Excellent condition. 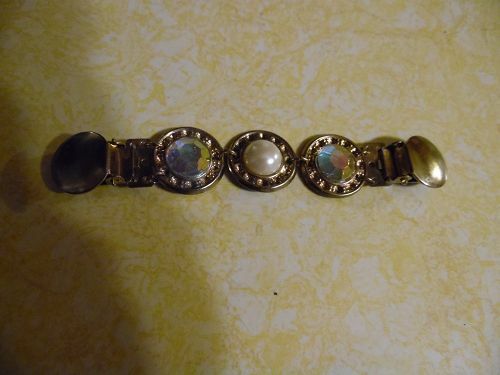 Nice dress clip or sweater guard Each gold tone piece has a large faux pearl and irridescent gemstone cabochon. Clip backing. Measures total 4 1/2" long. Very nice condition and clips are strong. 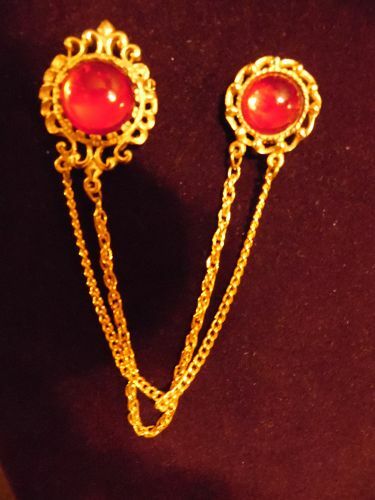 Pretty gold tone double chain sweater guard has pretty ruby red cabochons. Each back has a pin instead of a clip. Excellent condition. This is a beautiful Mexico Alpaca signed necklace, measures 15" inch long, the chain curves outward to fit the neck. Sections of enameling with shimmering fragments of abalone shell. The silver is referred to as alpaca silver, a nickel silver and not sterling silver. Matching pierced dangle earrings also marked. Beautiful set. The look of real pearls. Heavy cultured pearls with a realistic sheen and each pearl is knotted in between each pearl. Beautiful rhinestone center bow. Adjustable hook clasp. Silvertone setting. Measures 15" from hook to last bead. Excellent condition. What a pretty set to accessorize your fall wardrobe. 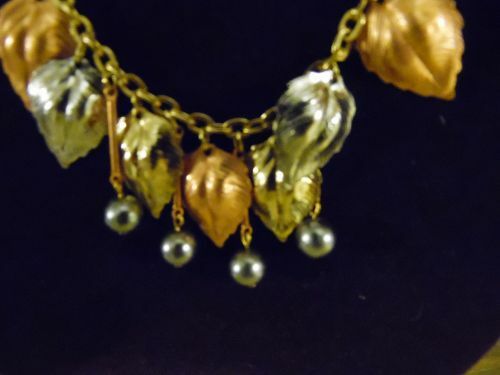 This set has multitudes of copper and silver tone leaves and silver faux pearls that hang from a silver tone chain. The leaves are stamped nicely with the veins and contours of a real leaf with a 3-d effect. Like new and looks to never been worn. 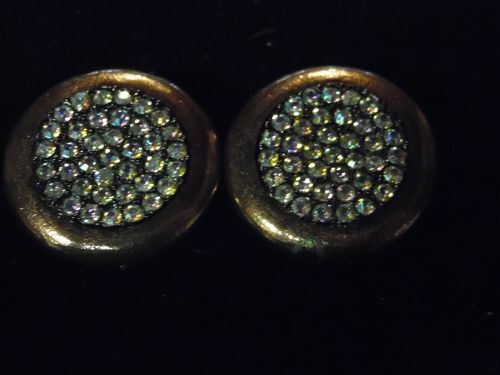 Clip back earrings measure 2 1/2" long. Necklace is 24" long. 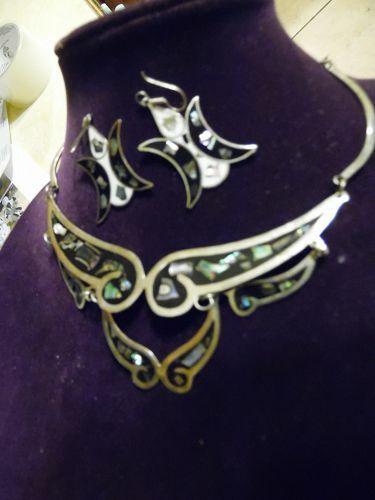 Gorgeous and unusual necklace and matching clip back earrings set. Gold tone filigree and hardware. 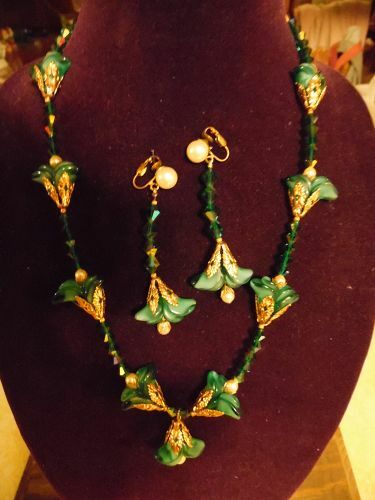 Teal green Glass beads form lilies with pearl centers, with gold tone filigrees that form leaves on the lilies. Spacer beads are teal color aurora borealis crystal beads. 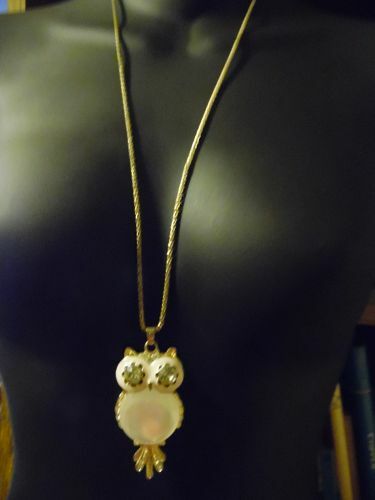 Necklace is 24" long and adjustable with a hook clasp. Earrings are 3" long. Simply awesome set. All beads are glass.